Organic foods have become all the rage; and not just for humans, but for canines, too. As pet owners are becoming more aware of the harmful ingredients that many pet foods contain, they are opting to feed their furry family members organic dog foods. Organic pet food is comprised of ingredients that are sourced from organic practices; in other words, the ingredients do not contain artificial additives and are not altered in any way. By feeding your four-legged family member an organic diet, you can ensure that he is receiving optimal nutrition that will meet his dietary need. Furthermore, you can also ensure that he isn’t eating artificial additives or other ingredients that have the potential to be very harmful to your pet. But, as more pet owners are switching to organic diets, there is an influx of organic dog food. Trying to weed through all of the options and choose the best formula to meet your pet’s needs can be hard. To help you find the best organic pet food, we’ve looked at dozens of different recipes made by various manufacturers. We’ve narrowed down the choices to what we consider the top five organic dog food options. What are the Benefits of Organic Pet Food? Now that you’ve had a look at our top choices for the best natural dog food, let’s take a closer look at each one. Below, we offer a more in-depth review of each product, including the ingredients they contain, what we like about them, and what pet owners who have used these products have to say about them. After you read through the reviews and decide which one is the best choice for your pet, click on the buttons to find the best prices currently available on Chewy and Amazon. Whether your canine companion is suffering from allergies, has a sensitive stomach, or you simply don’t want to feed him grain, than you might want to consider feeding him an organic grain free dog food. Many dogs are sensitive to grains like corn, wheat, and soy, as they can cause skin irritations or stomach issues. And, even if your pet isn’t sensitive to grain, feeding him a grain free organic dog food can only improve his overall health and well being. 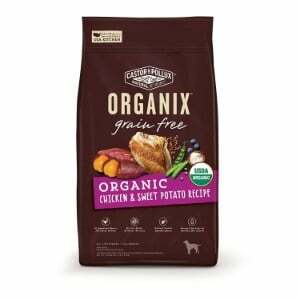 Castor & Pollux Organix Grain Free Organic Chicken and Sweet Potato is regarded as one of the best dry dog food formulas on the market. It contains natural, organic, free-range chicken as the first ingredient, so you know your pet will be getting premium quality protein. It’s also packed with superfoods, such as organic blueberries, organic flaxseed, and organic coconut oil. These ingredients contain a wealth of nutrients that can improve your dog’s overall health and well being. A bevy or organic vegetables, including sweet potatoes, chickpeas, peas, tapioca, and sunflower seed meal, are natural and very health carbohydrates that are easy to digest and provide your pup with the energy he needs. Formulated with essential vitamins and minerals, such as zinc, manganese, amino acids, potassium, and iron (and many more), this organic grain free dry dog food offers complete nutrition for your furry family member. Final Verdict: Castor & Pollux Organix Grain Free Organic Chicken and Sweet Potato Recipe Dry Dog Food is one of the highest quality dry dog food formulas currently available. Made with premium quality, all natural, organic ingredients, and completely free of grains, you can rest assured that your pet will receive the best possible nutrition when you feed him this organic dog food. 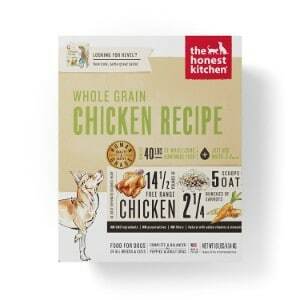 Whether you are looking for an organic senior dog food, an organic food for large dogs, or an organic food for small dogs, The Honest Kitchen Human Grade Dehydrated Organic Grain Chicken Dog Food is a fantastic option to consider. Made with all natural, organic, premium quality ingredients, your dog will receive the very best nutrition to meet his dietary needs when you feed him this formula. The first ingredient featured in this dry dog food is human grade organic whole chicken. The chicken has been dehydrated to ensure maximum nutrition for dogs of all ages and sizes. All other ingredients used in this organic dry dog food formula are also organic and human grade, including carrots, green peas, bananas, kelp, celery, potatoes, flax, oats, and barley. The inclusion of essential supplements, such as potassium, vitamin E, vitamin D3, copper, and amino acids, offer well rounded nutrition for any dog. Furthermore, all ingredients are processed in the United States, adhere to the strictest quality control requirements, and have not been genetically altered. There aren’t any preservatives, GMOs, or byproducts, so your pooch will receive nothing but the highest quality, all natural ingredients. Final Verdict: For a premium quality organic dog food, you can rest assured that your dog will receive the very best nutrition when you feed him The Honest Kitchen Human Grade Dehydrated Organic Grain Chicken Dog Food. This food is human grade, which means that it’s safe for you to eat, so you know that it’s safe for your pet to consume. While some people did complain about the odor, it’s important to note that the sense of smell is highly unique. If your dog doesn’t like dry kibble or he is having dental troubles that makes it difficult for him to consume dry dog food, then you might want to consider feeding him a premium quality organic wet dog food. Newman’s Own is famed for their all-natural food products that they make for humans, so you can rest assured that their dog food options are just as high quality. 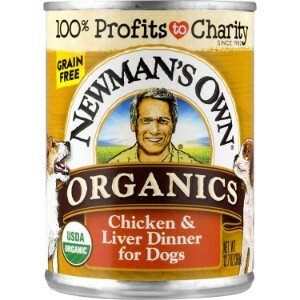 Their Newman’s Own Chicken and Liver Dinner for Dogs is regarded as one of the best quality organic dry foods available. The first ingredient in this organic wet food recipe is organic chicken and liver, so it serves up plenty of protein. Protein is a vital nutrient for dogs, as it supports the development of lean muscle mass, which is important for joint health. It also contains a bevy of all natural fruits and vegetables for added flavor and an enhanced nutritional profile. All ingredients are combined in a rich gravy and slowly stewed to create a meaty, tender meal that any pooch will love. There are absolutely no GMOs, artificial flavors, colors, or preservatives, this organic wet food will ensure your furry friend receives the nutrition that he needs. Final Verdict: Newman’s Own Chicken and Liver Dinner for Dogs is made with all natural, 100 percent organic ingredients. It’s infused with essential vitamins and nutrients to ensure your dog’s dietary needs are met. According to most pet owners, dogs love the flavor. If you are looking for an organic dog food for Jack Russells, a dog food for Dachshunds, a dog food for Yorkies, or any other small breed, Castor & Pollux Organic Grain Free Organic Small Breed Recipe Dry Dog Food is a great option. It’s specially formulated for small dogs and contains the essential vitamins, minerals, and other nutrients that dogs of smaller statures need to thrive. The first ingredient in this small dog formula from Castor & Pollux is USDA certified organic free range chicken, which is a premium source of protein that is easy to digest. It also contains organic superfoods that are packed with nutrients, including flaxseed, blueberries, and coconut oil. Other premium all natural ingredients include peas, chickpeas, sweet potatoes, and sunflower seed meal. It’s also infused with essential vitamins, minerals, and nutrients that small breeds need to thrive. 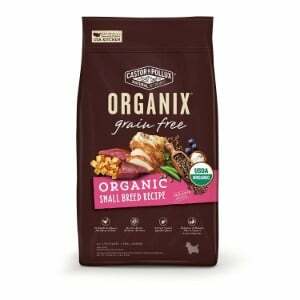 Final Verdict: Whether you have a Shih Tzu, a Boston Terrier, a pug, or any other small breed dog and you are interested in feeding him an organic dog food, consider Castor & Pollux Organix Grain Free Organic Small Breed Recipe Dry Food. Made with premium quality organic ingredients that are certified by the USDA and AAFCO, and specially formulated for small dogs, your tiny furry friend’s nutritional needs will be met. The first ingredient in this formula is USDA certified organic chicken that is safe enough for humans to eat, so you can be sure that it is safe for your pet to eat, too. It also contains USDA certified organic peas, which is a source of carbohydrates that are not only healthy, but easy to digest; so, if your pup has a delicate tummy and you are looking for a dog food for sensitive stomachs, than this might be a good choice for him. To make digestion even easier for your furry friend, this organic dog food is also completely free of grains, which will keep digestive issues at bay and also prevent skin irritations if your pet is prone to food sensitivities. A variety of other organic vegetables are also added to the formula to make a well balanced, highly nutritious meal that your pet will be sure to love. According to most pet owners, their dogs love this organic kibble. 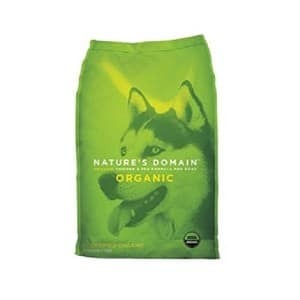 Final Verdict: For a high quality organic dog food that has received rave reviews from countless happy customers, Kirkland Signature Nature’s Domain USDA Organic Chicken and Pea Formula Dry Dog Food is definitely worth considering. It has received outstanding reviews from both pet owners and our panel of experts. It improves digestion, reduces skin irritations, and improves overall health and wellness. Your dog is more than just a pet; he’s a member of your family. As a beloved part of your family, it’s important to provide your canine companion with the very best of care, and that starts with feeding him a premium quality dog food that meets all of his nutritional requirements. While there are so many different dog food options on the market, if you want to ensure that your pet is eating the absolute best food possible, then you should consider feeding him a holistic dog food. But, what exactly is organic dog food? What benefits does it offer? And what should you look for when shopping for an organic pet food? In this section of our review, we answer these questions so that you can make the most educated choice for your pup’s nutrition. Just like organic food for humans, organic dog food is made of all natural ingredients. The ingredients can vary, but can include protein (which should be the primary ingredient in all pet foods – even recipes that aren’t organic), vegetables, fruits, and grains. In other words, the ingredients are grown, raised, and cultivated using natural methods; no artificial or man-made materials are injected into them and they are not altered in any way. For example, if an organic dog food contains chicken, that chicken should be free range and antibiotic free; if it contains vegetables, those veggies should be grown using natural fertilizers and completely free pesticides and GMOs. Given the fact that organic pet food is made with all natural ingredients, it’s pretty easy to understand why so many pet parents have decided to feed their four-legged family members these types of foods. Generally, since these foods contain ingredients that are all natural and haven’t been altered in any way, you can have peace of mind knowing that your pet won’t be ingesting synthetic ingredients or chemicals that can have adverse effects on his health. Improved digestion. Since organic foods are free of contaminants, it’s less likely that they will irritate the gastrointestinal tract. It’s far easier to digest natural foods than it is to digest foods that contain synthetic additives. Reduced allergies. If your pet suffers from allergies, feeding him an organic food might help to reduce his symptoms. Often times, canines suffer from allergies, not because of the actual ingredients in the foods that they are eating, but because of the additives that are put into those ingredients. For example, if your pet has sensitive skin, it might be because he is having a reaction to the chemicals that his food is treated with; not an actual ingredient, like grain. Strengthened immune system. Since there aren’t any artificial ingredients in organic pet foods, your dog’s immune system will improve. The reason? – Because his immune system won’t have to combat any artificial ingredients that it may see as harmful, which means that it will be stronger and more prepared to fight off actual infections; in other words, your dog will be a lot healthier when you feed him organic food. Make sure that you look for a certification on the pet food. In order for a food to be considered organic, it must be certified. A USDA certification, for example, illustrates that the food is organic; it contains ingredients that have been grown, raised, harvested, and manufactured in ways that comply with organic regulations. Check the ingredients. Make sure that you look at the list of ingredients. They should clearly state that the ingredients are certified organic, and what they are. Also, make sure that the first ingredient is natural, organic meat, as protein is the most important part of a dog’s diet. In addition to looking for these elements while you’re shopping for organic dog food, there are some other things that you should keep in mind while shopping. For example, consider the age of your pup, the size, his breed, and any allergies that he might have. Remember that all dogs have different nutritional needs, and you want to provide him with a food that will improve his health, not harm it. If you want to improve the overall health and well being of your pup, he is suffering from allergies, or you simply want to avoid feeding him foods that could contain harmful substances, you might want to consider switching to an organic pet food. Organic pet foods can provide a number of notable benefits for your four-legged family member. By purchasing any of the foods listed in our review, you can rest assured that your furry pal will be receiving the best and safest nutrition possible. But, if you opt to choose a different type of organic pet food, make sure that you do your research and choose an option that truly is organic and formulated to meet your pet’s unique dietary needs.